In previous generations, it was known simply as the 3 Series coupe. Now, in a dramatic departure, BMW has moved up market with the all new 4 Series based off of the F30 3 Series sedan platform. BMWBLOG thought it would be a good time to look at the competition that BMW will face in this market segment. Not simply a name change, the BMW 4 Series has marked body differentiation from the sedan and the result is a gorgeous coupe, but it will come with an increased price. According to Automobile Magazine, September 2012, it is going to represent around a $4500 premium over the 3 Series sedan. This is a big departure from the previous $1200 to $1300 to step up from a 3 Series sedan to a 3 Series coupe. With a bigger price jump there are bigger expectations. Based on looks alone so far the 4 Series is well on its way to deliver. 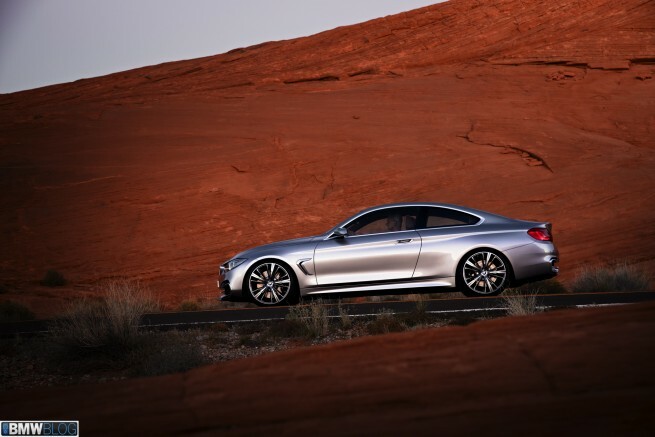 The BMW 4 Series will enter a crowded field in the premium coupe market. BMW’s main rival will be the Audi A5/S5 and it represents some pretty stiff, established competition. Car and Driver in July of 2011 called the A5 among the most beautiful cars on the road. Audi started this whole new model war when the A5 debuted in 2007, as a new coupe based off of the Audi A4 and in 2011 under went a mid-cycle refresh. optioned all the way to a RS 5 450-horsepower version that has a 0-60 mph of 4.5 sec and a top speed of 174mph. The RS 5 starts a $69,975 and is targeted at BMW’s M version of the 4 series that is still under wraps. From Mercedes the coupe line up that will compete with the BMW 4 series are the C-Class Coupes – the C250, C350, and C63 AMG Coupe. MSRP ranges from $37,800 for the C250 Coupe that comes with a 1.8L turbo charged 4 cylinder with 201 horsepower, all the way to a MSRP of $62,330 for a normally aspirated 6.3L AMG V8 that produces 451 hp, 443 lb-ft of Torque. The design of these coupes, however, do not mark the design departure that the new 4 Series does from the F30 3 series sedan. Infinity likes to present themselves as hi-performance luxury, and their G37 Coupe backs the assertion of hi-performance with most base horsepower in the premium coupe segment. The G37 Coupe comes with available all wheel drive and an MSRP that begins at $39,800 with a potent 330 hp 3.7L V-6. MSRP range climbs up to $44,900 for the G37 Coupe Sport 6 speed manual transmission but the design has been around since 2009 and hasn’t been updated much save for the introduction of the IPL G coupe at $50,500 with some different body cladding and a 348 hp 3.7L V6. in the entire segment. Yawn. Lastly, Cadillac does technically have a coupe in this segment, the CTS and CTS-V but it’s rather unsightly to this scribe. They range from a base price of $38,90 to $55,440. The base motor is a 3.6L direct-inject V6 with 318hp and the CTS- V comes with a, gulp, 556 hp 6.2L supercharged V8 that twists out an astonishing 551 lb-ft. Both of these rather “wedgie” looking coupes come with a Limited Slip differential, please take note BMW a LSD in their base version just like the Caddy ATS. With that much horsepower and torque, I could almost, well, almost forgive the CTS-V’s polarizing looks. Though there is some tough competition in this premium coupe segment for the new 4 Series, it’s biggest competition comes from the overwhelming success of the previous generations of fabulous 3 series coupes. Indeed, the 4 Series has some big shoes to fill. Given, the looks of the new 4 Series, it appears to be well on its way. BMWBLOG looks forward to our driving review to see if it drives as well as it looks. Bmw eat them entire those cars…. Yeah! Of eat car, entirely! Apart from BMW,all of them look boring. May I ask which part of volkswagen you work for? The one which produces Buggati, Bentley and Porsche as well!